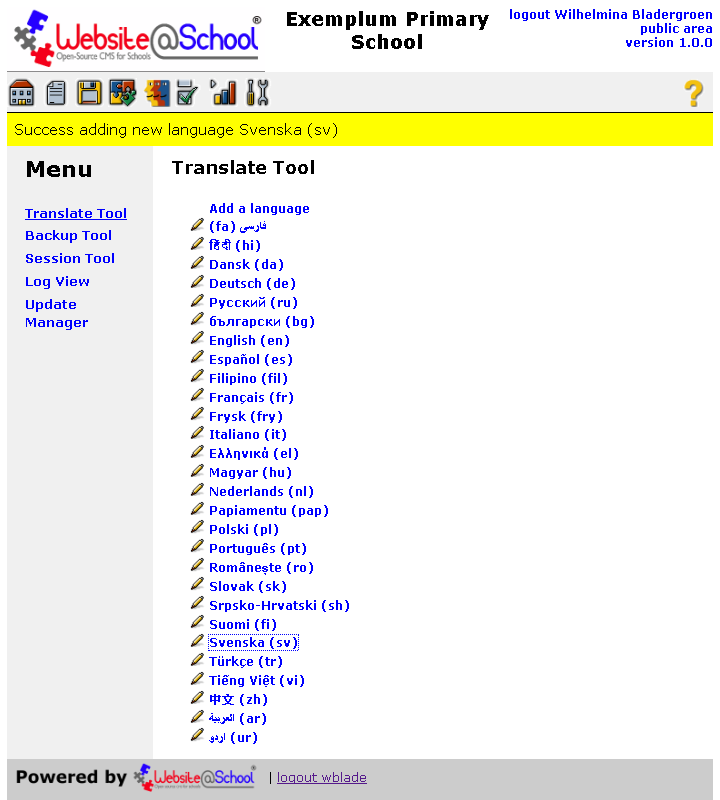 The Translate Tool to translate the Website@School program. The Backup Tool to make backups of the Website@School database. 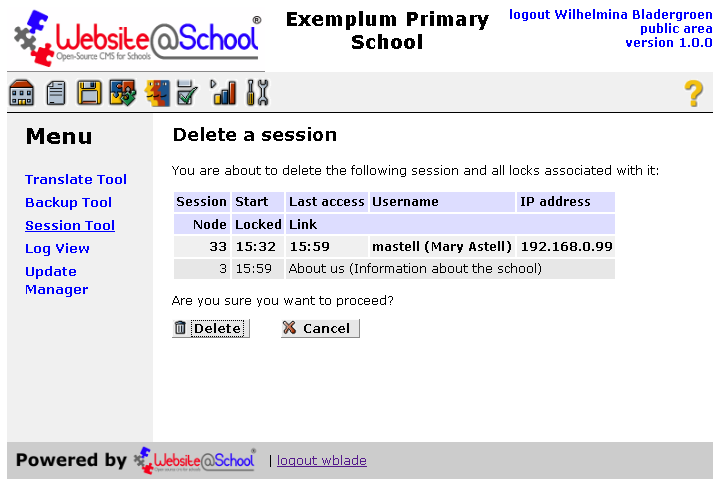 The Log View to keep track of what happens on your Website@School installation. The Session Tool to remove sessions and associated locks. The Updates Manager to install updates. The features of each tool are discussed in their own sections. The opening screen is split in two parts, the Menu pane and the Tools pane. Task selection: Select a specific management task by clicking on Translate Tool, Backup Tool, Session Tool, Log View or Update Manager. The task becomes underlined and is opened in the workplace pane. Managing a task: When a task is selected, its configuration options become available in the workplace pane. Tools: Here you can find various tools. 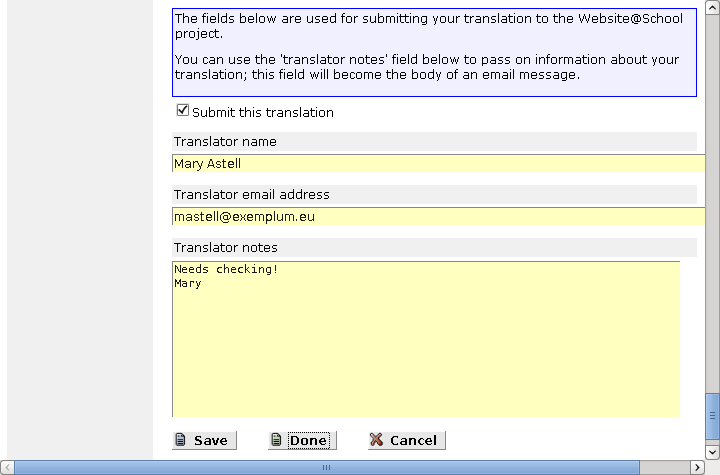 With the Translate Tool you can add new translations to the program or modify existing translations. The Backup Tool allows for downloading the complete database for this site. The Session Tool allows for forcefully ending stray sessions, and unlocking locked pages and sections in the process. Log View allows you to browse through log messages. 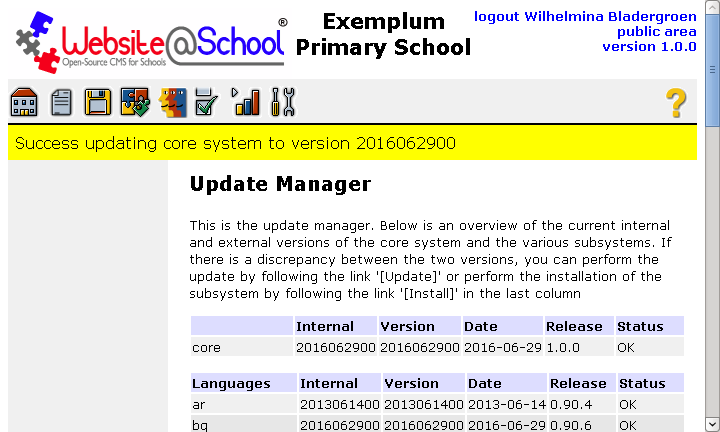 The Update Manager is used whenever a new, updated version of Website@School has to be installed on an existing website. 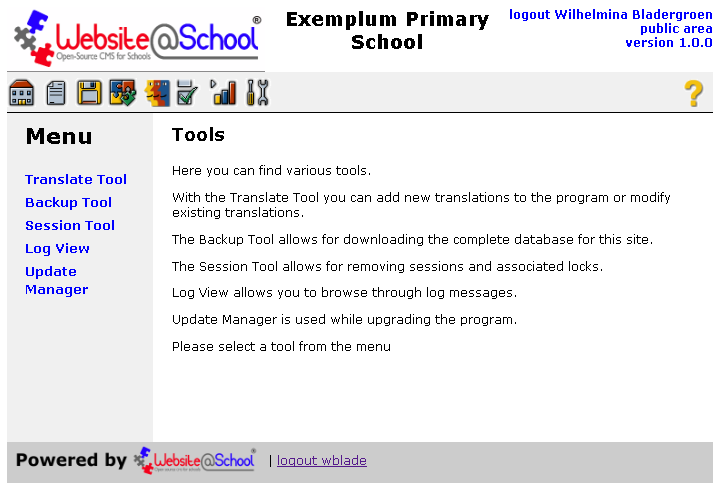 For Website@School program translators the Translate Tool is extensively explained in chapter Translate Website@School Program. Please go there when you want to translate the program. Selectable language: When translating, two languages are available for easy reference: English and a selectable language. UTF-8: Fully UTF-8 (8-bit Unicode Transformation Format) compatible. That is, no problems with diacritical characters and non Western languages like Chinese, Hindi, et cetera. Shortcuts: Shortcut keys can be assigned language dependent. Notes: Notes can be added to translations. 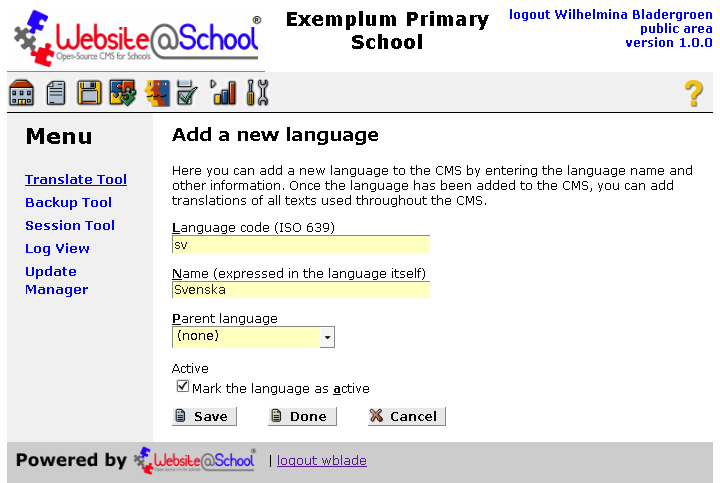 Submit language: A copy of your translation is send per e-mail to the Website@School project. Default the option is checked. The copy is sent to the address specified in the Configuration Manager > Site > Website From: e-mail address. The list of languages is visible. Menu: The selected tool is underlined. The other tools may be grayed out, i.e. not accessible for the currently logged in User. Translate Tool: Workplace header text. Add a language: Clicking on this link opens the Add a new language dialogue. Adding a language is discussed in section 3.2 Add a new language. Pencil icon: Clicking the pencil opens the Edit language properties dialogue. These options will be discussed below in sections 3.4 Edit language properties. The language name is shown in that language, i.e. not as 'French', but as 'Français'. This options will be discussed in section 3.4 Edit language properties. Language code (ISO 639): A two or three character code representing the language must be entered here. The official ISO-639 complete code table can be found at http://www-01.sil.org/iso639-3/codes.asp. For further details on this matter, see Wikipedia on http://en.wikipedia.org/wiki/ISO_639. Name (expressed in the language itself): Enter the name of the language, for example: Français, اردو Tiếng Việt български. Website@School uses a mother and a parent language. The mother language is always English. The parent language can if available, be selected in the dropdown menu. By replacing words and sentences from the parent language in your language, you create the new language. 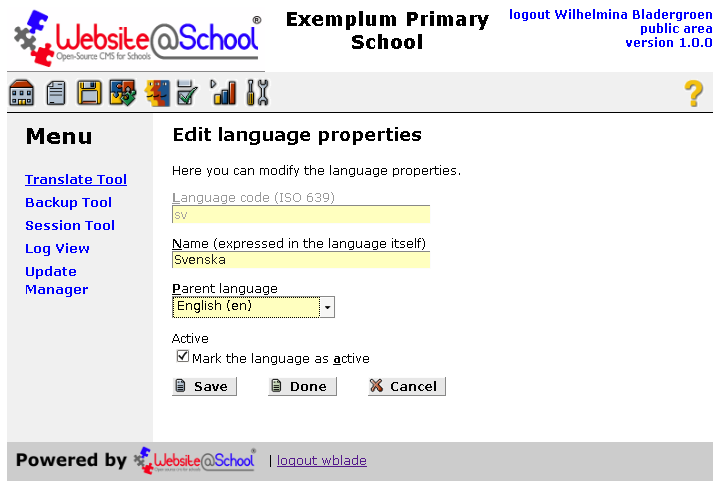 If the default (none) is selected, English will be the parent language. Carefully choose the parent language. The choice of the parent language is permanent and cannot be changed or undone. Active [ ] Mark the language as active: If checked, the language is selectable by the administrator when she selects the language for a user. This is explained in section 3.2 User properties, access permissions, group/capacity memberships in chapter Account Manager. [Save], [Done], [Cancel]: Please refer to section 2.3.3 [Save], [Done] and [Cancel] in the chapter Basic procedures for beginners for more information. By selecting the (added) language name, you can start translating. This is discussed in the section below. 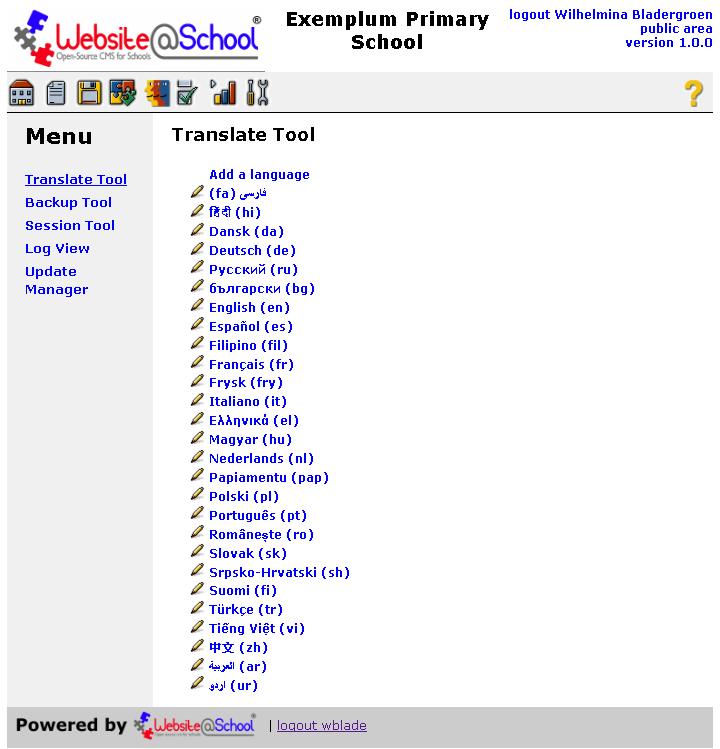 Menu pane: The different parts of Website@School program to be translated. By clicking the other links in the Menu, the other parts become accessible. Workplace pane: Here the actual translation process takes place. It is extensively described in chapter Translate Website@School Program. At the bottom of this screen there are a few housekeeping fields. These are used as a means of communication between the translator and the Website@School project and the webmaster of the website. Submit this translation: Please leave this option checked. Better submit an unfinished translation than to forget it accidentally. Translator name: Enter your name here. Translator email address: Enter your email address, so we can reach out to you if necessary. Translator notes: Space for your own notes or message(s) to us. Most translators use this part to ask us questions about the (sometimes confusing) meaning of words and phrases. 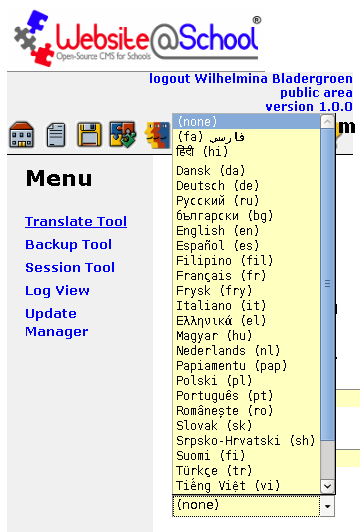 After clicking the [Done] button the translation is saved and the list of languages re-appears. If the Submit this translation box was checked, an e-mail message is sent to the Website@School project and the webmaster of the website. Attached to this message is a backup copy of the translation. As a rule the size of the submitted file (sv-was.bin in this example) is small. This is because only the changes are submitted rather than the full translation. This dialogue is the same as the Add a language dialogue. You can correct errors in the name of the language and change 'active'. The language code cannot be changed. Language code (ISO 639): The chosen language code cannot be changed. This is a feature. Name (expressed in the language itself): Errors can be corrected. Parent language: Once translation of a domain (e.g. General, Login or Administration) is started, all untranslated phrases will be in the parent language. If the parent language is changed, it applies only to new translations, e.g. whenever a new module or theme is added to Website@School. Mark the language as active: When the box is checked the language is selectable by the users in their language selection. See also section 3.2.1 Basic: Edit User username (Full Name) in chapter Account manager and section 3. Edit profile in chapter My page. Go the the right place for the text you want to change. Make the changes and save them. Please send them to us so others can use them as well. If you are not happy with the abbreviations for the icons in high visibility mode, you can use the list below to change the abbreviations. 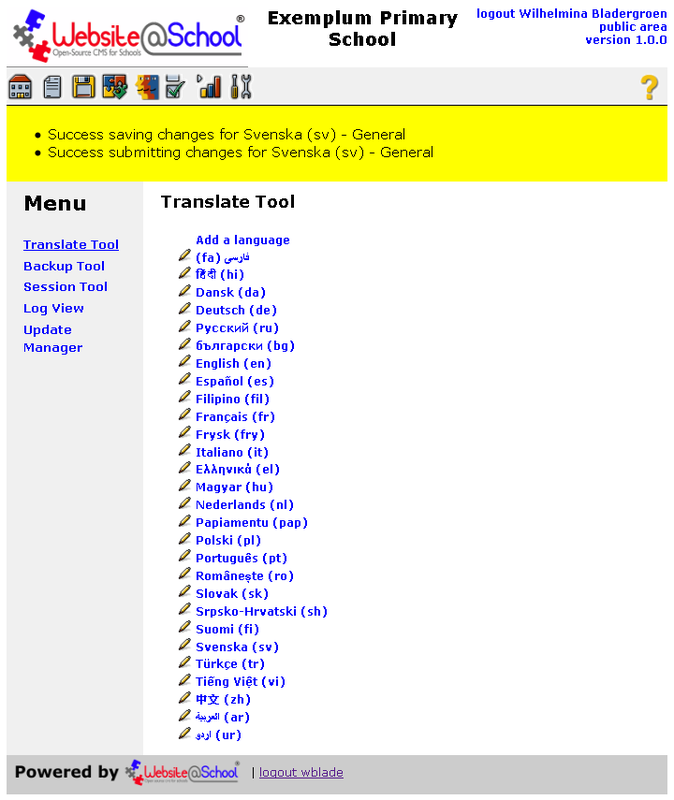 All adaptions are done in Tools > Translate Tool > Select a language > Select 'Administration'. Here you can change the characters and signs. General: Easily create backups of the Website@School database. Unique filename: Each backup has its own unique name. No risk of overwriting older backups. Access control: only Users with permissions for Tools (Backups) can create backups (see section 3.2.4 Administrator permissions: username (Full Name) in chapter Account manager). Database backups can be quite large. Observe the memory_limit in php.ini in relation with the database size. The backup tool only makes a backup of the database. 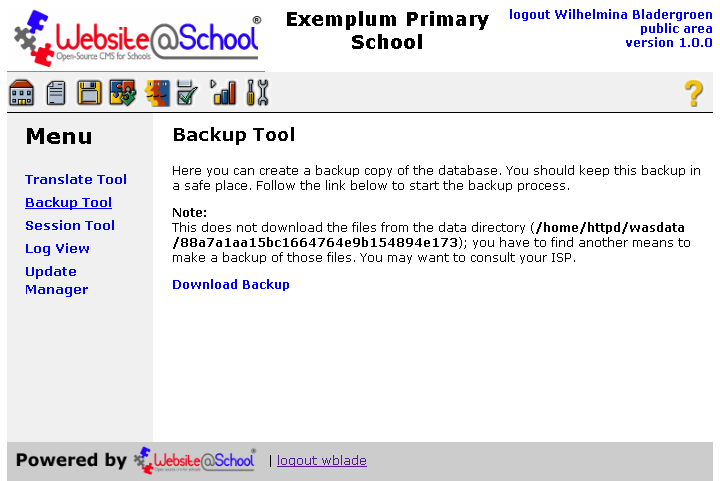 To make a backup of the Website@School data you need to use another tool, e.g. the Filezilla File Transfer Program (FTP), see http://filezilla-project.org. Click on the link Download Backup. A window on your own computer opens. Select a directory to save the backup. Save the backup in that directory. 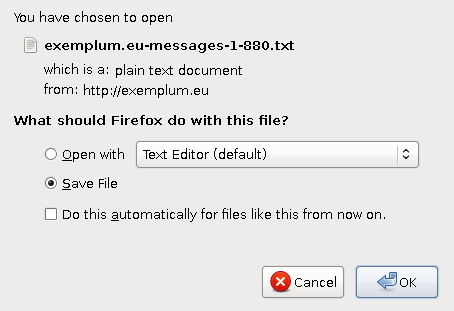 The backup has a name like: exemplum.eu-was-was-20160707-135523.zip, which is patterned after this format: [website]-[dbname]-[prefix]-[yyyymmdd]-[hhmmss].zip. Note that these data files are not backed up by the Backup Tool. You can backup them on the server with the tools available. Contact your ISP or systems administrator for information. It's a good idea to make regular backups, say once per night. There is an abundance of automatic backup software that can do this job, either on the school server, a school workstation or a computer at the webmasters home. 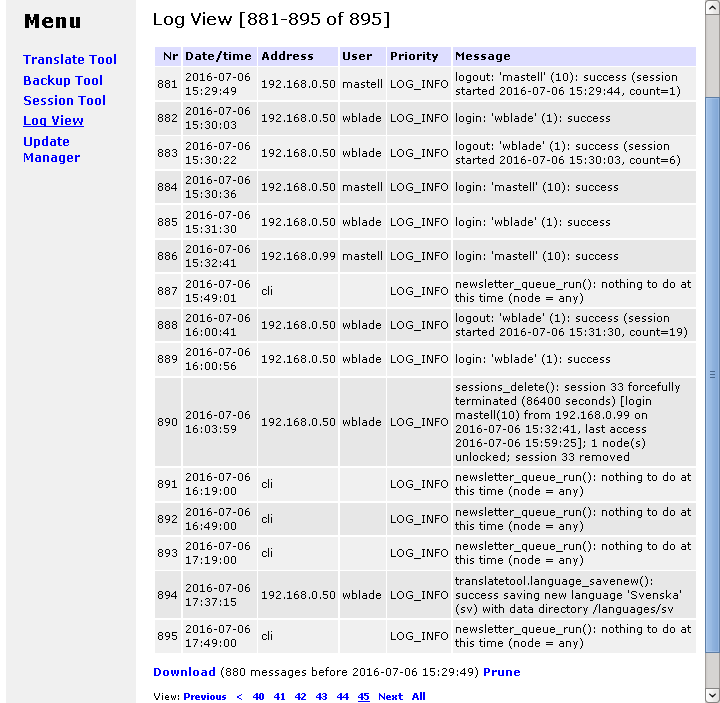 A systems administrator once said: "Your logs are your friends". 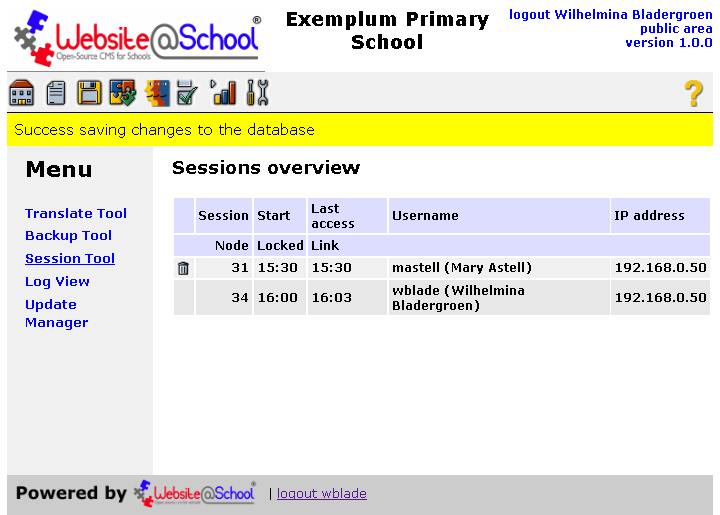 In Website@School many events are logged to the log table. 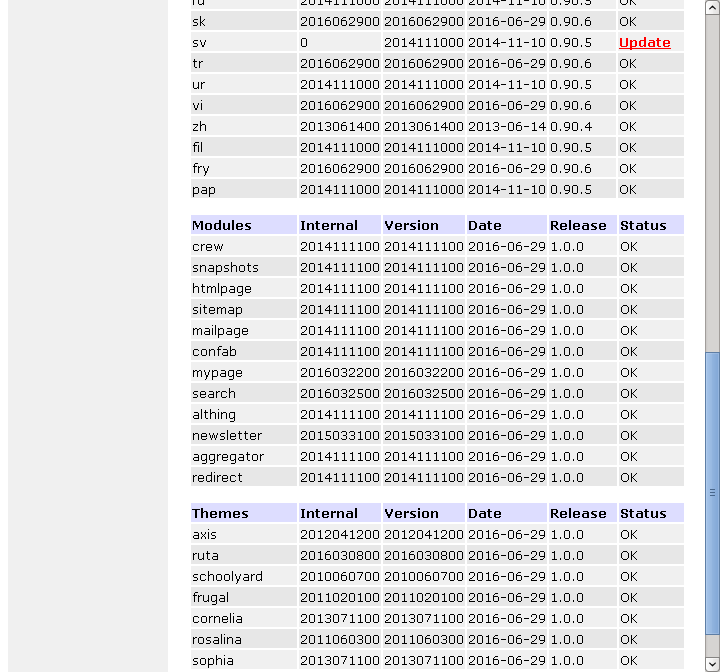 If you have the necessary privileges Tools (Log viewer) you can browse the contents of the log table. (See section 3.2.4 Administrator permissions: username (Full Name) in chapter Account manager for more information about privileges). Log view [nnn-nnn of nnn]: this title conveys which messages are currently displayed. By default Log View shows the last page of the message log, i.e. the most recent messages. Date/time: indicates when an event happened. Address: the IP-address from which the event was triggered. User: if known, the name of the user associated with the event. Message: detailed description of the event. Previous < nn nn nn > Next All: a navigation bar to make it easier to page through the usually long list of messages. The address 'cli' indicates that this event was ultimately generated from the command line interface of the PHP language interpreter that is used to run the Website@School program. As a rule these are the events that happen when the cron job is run. See 4.4 Configuring cron.php in chapter Installation for more information about running cron jobs. If you click on the link Download, your browser will present you with a dialogue similar to the one below. If you click the button [OK] a file will be downloaded on your computer. This file will contain all log messages older than the first message that is currently visible on your screen. In the example given that would imply 880 messages recorded before 2016-07-06 15:29:49. The format of the downloaded file is Comma Separated Values (CSV). Below is a snippet of an example file. This file can be imported in a spreadsheet program, for further processing. id,"datim","addr","username","prio","message" 1,"2016-06-20 10:02:41","192.168.0.50","wblade","LOG_INFO","login: 'wblade' (1): success" 2,"2016-06-20 10:06:13","192.168.0.50","wblade","LOG_INFO","logout: 'wblade' (1): success (session started 2016-06-20 10:02:41, count=11)" [...snip 873 lines...] 876,"2016-07-06 15:29:33","192.168.0.50","wblade","LOG_INFO","logout: 'wblade' (1): success (session started 2016-07-06 09:31:49, count=50)" 877,"2016-07-06 15:29:44","192.168.0.50","mastell","LOG_INFO","login: 'mastell' (10): success" 878,"2016-07-06 15:29:44","192.168.0.50","mastell","LOG_INFO","session 27 timed out (86400 seconds) [login wblade(1) from 192.168.0.50 on 2016-07-05 09:45:46, last access 2016-07-05 15:25:59]; nodes unlocked: 0" 879,"2016-07-06 15:29:44","192.168.0.50","mastell","LOG_INFO","dbsession_remove_obsolete_sessions(): removed sessions: 1, removed locks: 0, unlock errors: 0" 880,"2016-07-06 15:29:44","192.168.0.50","mastell","LOG_INFO","admin.php: 'mastell' (10) is no admin and was redirected to index.php or login"
Eventually the log table may grow and grow and grow until it is huge. If you click on the link Prune, your browser will present you with a dialogue similar to the one below. This confirmation dialog asks you if you are sure that you want to delete those 880 messages. It also gives you one last chance to download the selected log messages via de Download link. Clicking that link yields the download dialogue discussed in the previous section. If you click the button [Delete], the selected log messages will all be deleted. Note that there is no way to ever undo this deletion. After deleting is complete the following is displayed. Note that the list of log messages is now not paginated (the title says Log view without the [nnn-nnn of nnn] postfix). Also note that the message that was numbered '881' now is the first (Nr=1) in the list. 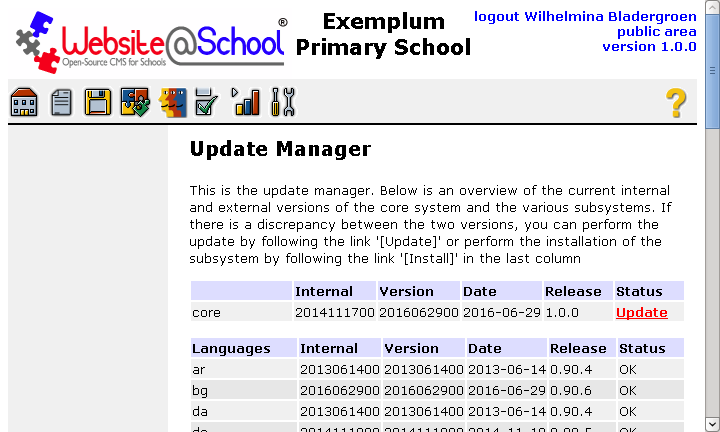 Ater a successful update the new modules and themes are not automatically available in the demonstration data installed in the Exemplum Primary School areas. Only in a new installation with demodata the new features are installed without the need of adding them manually via 'Add a page'. Download the compressed (.zip or .tgz) upgrade (either a program update, a manual update, a language pack or a module) and unpack it in the CMS Root Folder. See section 1.1.3 Webservers and folders in chapter Installation for more information about names of directories and folders. Please read section 3. Tips for a secure installation in chapter Installation before proceeding any further. Security is vital! After unzipping and checking security, log in with the guru account (webmaster, Wilhelmina Bladergroen). For a core update you are directly sent to the Update Manager dialogue. For other updates, go Tools > Update manager. After a successful unzip of the Website@School program, you may encounter error 50 on the school website, indicating you did not yet perform the upgrade. the link Install, indicating that the a new language, module or theme must be installed. In this example the core requires an update. If you click on the link Update, the core program will be updated. Aterwards a message like the following is displayed. The core is now up to date. Information on the internal version number can be found in section 4.1 Site configuration in chapter Configuration Manager. 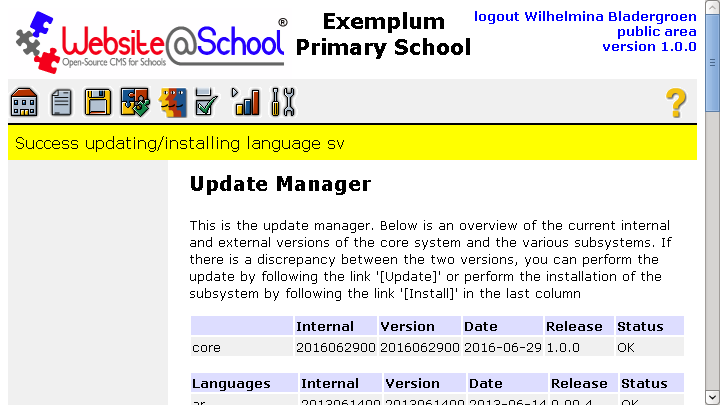 After upgrading a module, manual or language, login as webmaster and check Tools > Update Manager. Here a single language needs to be updated. Follow the link Update to update this language. The following will be displayed. If there are no other pending updates or additions that need to be installed, your version of Website@School is completely up to date. In some circumstances it happens that a page or a section is locked by a User and it is desirable to regain access to that locked page at short notice. See also section 7.1 Locked page in chapter Basic procedures for beginners. If you have the necessary privileges Tools (Session Tool) you can forcefully end sessions and unlock pages and sections. See section 3.2.4 Administrator permissions: username (Full Name) in chapter Account manager for more information about privileges. To solve the issue of the locked page, click Session Tool. A screen like the following will be displayed. one from the computer with IP-address 192.168.0.99 (started at 15:32, session 33). Note that session 33 has locked page 3 About us (Information about the school). This means that only Mary Astell is able to unlock this page; currently nobody else can unlock or edit this page. There is no garbage can next to session 34 because it should never be possible to end one's own session this way, not even by accident. In other words: wblade can end all sessions with the Session Tool except her own session. 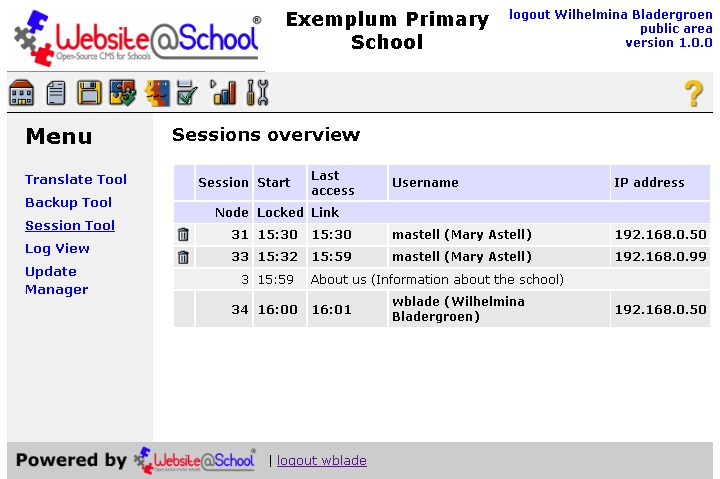 Wilhelmina Bladergroen has enough permissions to use the Session Tool. Clicking the small garbage can next to session 33 yields the following dialogue. By clicking the button [Delete] session 33 will be forcefully ended and also all locks held by this session will be released. After succesfully removing the session from the database, the following dialogue is displayed. Note that session 33 is no longer in the list of active sessions. This implies that page 3 is no longer locked. Ending a session this way is not very elegant; it might end a session where some User is legitmately editing a page. If the session is ended with force, all that User's changes that were not already saved are lost. The User will probably don't like that, so use this tool with care.